This is the first day of our Mega Marathon when we blog about Flatbreads & More. As I declared yesterday, I am doing A to Z of Dosais thanks to a mutiny by the husband and daughter. My original dish for A was to be Appam which is not only my favorite dish but also that which has been on my to-do list for more than 2 years. But I can’t begin to tell you how big a disaster it turned out to be when I tried it. I couldn’t even salvage one decent looking appam to click a picture. So, with a heavy heart I had to abandon it. The problem was that I had multiple dishes for some other letters but I was so confident of my appam making skills (can’t believe myself!) that I had no backup dish for the letter A. Can you imagine a more chaotic beginning to a month long mega marathon? Well, actually I can thanks to the other mega marathons I have done and survived. Anyway, so I finally figured that Adai starts with A and also surprisingly I hadn’t posted the recipe yet despite the frequency of it being an early dinner or late breakfast. This recipe is a combination of my mother’s and mother-in-law’s. I kind of picked up stuff I liked about each recipe and made one for myself. You can also mix up the lentils as you like. If you like any one of the lentils more, you can increase the quantity and reduce the quantity of the other lentils accordingly. 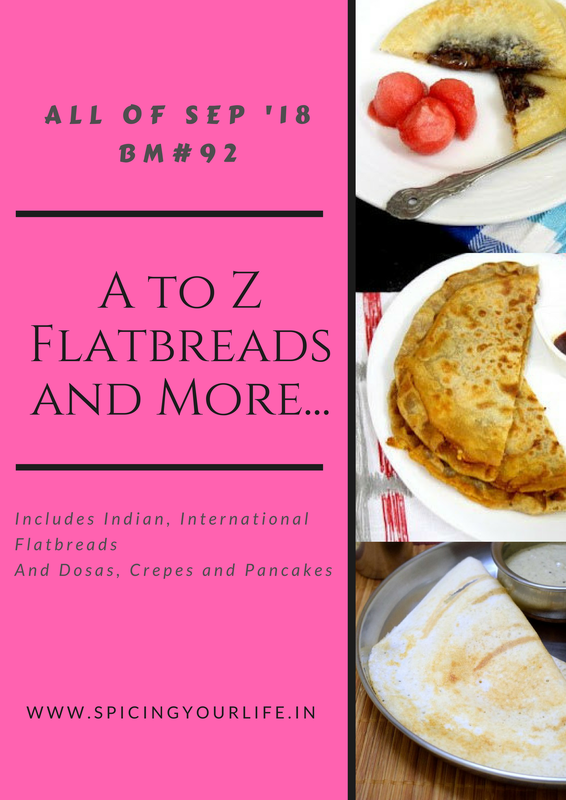 Previous Post A to Z Flatbreads & More…..
Thats an incredible theme, A to Z dosais, sounds wonderful. Am sure you gonna rock with this theme SowmyaNutritious and protein adai looks absolutely prefect to finish my dinner. I was also expecting International flatbreads from you Sowmya! Adai is such a classic favorite and I love mixing and matching the lentils and millets and rice when making it. Love the vellam, vennai and aviyal on the side. Nothing can eat these combinations. Good one, Sowmya. I have had appam in my to-do list for more years than I can count and I cannot imagine the stress of a failed recipe before the mega bm. Good that you could come up with Adai as a backup. Appam is still on my to do lists , but truly Adai is such a lovely , nutritious breakfast , and you have got a scrumptious one here . I am already hungry , looking forward to the series which would be a great learning experience . A nice surprise Sowmya. I thought you will be doing International theme. I know you will do great in this theme too. Waiting for all your dosas this month. Between the adai looks awesome and it is one of most fav breakfast dishes. Excited to see 26 different varieties of dosas’s from you. The adai looks very delicious and tempting. I’m so glad you’re doing the dosa pancake version. I really need to learn more types of chilas or adai. A tempting beginning to the Marathon, would have never thought of using toor dal for adai or chilas. ye Adai came first in my mind to start this BM. This is such a protein-packed breakfast and very healthy. Great to see that you have used dals which are not commonly included in adai. Looking delicious. I love Dosas and I am so glad you picked up that theme..:)..We love appam and make it alternate sundays and love the spongy texture. Though I am so fond of Adai, we dont’ make that often and also ours is a thinner version, so surely bookmarking this.. I assumed you would be doing an international theme Sowmya!Can’t wait to see the other dosa varieties in this series. Adai is such a protein packed breakfast and a good pick for the day. Wow.. great start of mega marathon with dosa or crepes… Looks so yumm and tasty. Healthy recipe.